MySQL is not a necessary component in RaidenHTTPD, but many web programs such as forum softwares use it. It is better to have one so you can make use of many free web programs on the internet. Note: Downloading v4.0x is strongly recommended. 2. Un-zip the package and run setup.exe. Please make sure to install to the c:\mysql, the default location. We'll use this path throughout the whole tutorial. Unless you know what you are doing, otherwise, please do not change it. Open this file with Windows Explorer c:\mysql\bin\winmysqladmin.exe . Double click on this executable file to launch the application. Once it has been started, please notice its icon on will appear in the icon tray. You will see the server options and startup options for setting up the system service. However, you still need another tool for database management up to this point. Now, we are going to teach you how to create a database. First of all, start a command prompt (start cmd.exe) and change to c:\mysql\bin\ directory. 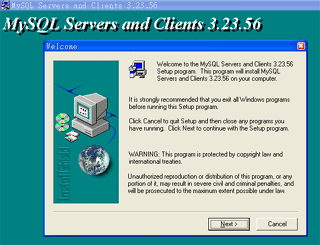 Run mysql.exe -u root (This means you login as root but the password is empty). Simply type CREATE DATABASE raiden; and hit enter. As of now, your database has been created. If you are not getting used to this command prompt style, please do not panic because a GUI-based administration tool will assist you in handy. Although GUI-based administration tool requires a little bit extra setup effort, it will benefit those of you who do not get used to the classic command prompt. Please following the link in '5. A few words' on this page for the tutorial on the GUI-based administration tool. .
4. Plase DO remember your default database manager account and password! and your default root account password is empty (an empty string , 0 byte long). And yet, you will be allowed to connect to your MySQL™ with this account and password via localhost loopback network.